SOCIETY OF PREVENTIVE PSYCHIATRY - WFMH, WASP MEMBER AND WPA AFFILIATE MEMBER. 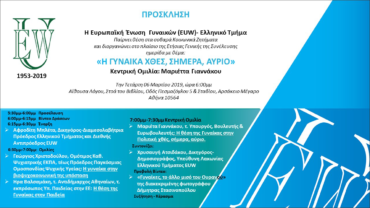 ΕΤΑΙΡΕΙΑ ΠΡΟΛΗΠΤΙΚΗΣ ΨΥΧΙΑΤΡΙΚΗΣ - WFMH, WASP ΜΕΛΟΣ ΚΑΙ WPA ΣΥΝΔΕΔΕΜΕΝΟ ΜΕΛΟΣ. 10 October 2016 18:30, University of Athens For further details about the World Mental Health Day, please visit the Greek section.